Our vision is to create a fantastic community club for boys, girls, tennagers right through to veteran players. All our emphasis is placed on having fun and enjoying playing. Too much emphasis is placed on winning at all costs and we see children stop playing. From our toddlers program upwards we target developing skilful players. Once they move into secondary school (age 11+), the basic skills of control and passing should be strongly embedded. Unfortunately, that is mostly not the case at most teams and too much time is spent rectifying the problems that should have been taken care of much earlier. We know that through our coaching programme we are giving these young people the best opportunity to reach their potential over the long term. In short, we are looking to produce players who can pass with precision, control with comfort, run with purpose and play with joy. Our coaches use our player development systems and they are all FA qualified, CRB vetted and they have attended Child Protection Workshops so you can rest assured that your children are safe. 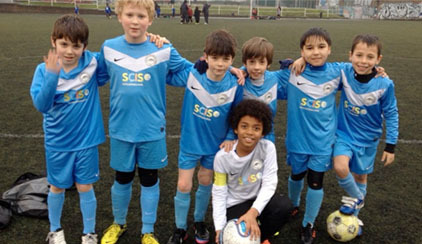 As one of the biggest football clubs in North London, we have over 30 youth teams from under 7 to under 15 age groups. Our full time admin staff manage all our various programs from our toddlersfc program, our local league teams to our International travelling squads. We guarantee to give a place to every child and we have a concessionary rate program to all our children. Our club size enables us to provide motivated youth players the opportunity to develop their skills to the fullest extent possible, provide top flight professional instruction, experienced coaching in a positive yet challenging environment and do what is in the best interest of our players. This formula has proven successful year after year and continues to guide our Club. Our program allows us to employ local full time staff and we need them as we have over 400 children playing with us and our payment programs allow us to give a place to Every child that comes to our club. We are a community program that does not require external funding. Philanthropy is woven tightly into our football club culture. We donate time, energy and financial resources to a variety of charitable, social and health-related causes on a local basis.